"This excellent book is a great tool for people fighting environmental hazards in their communities. 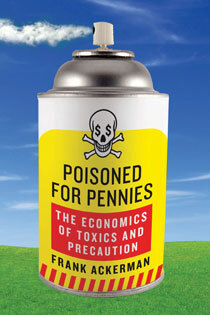 Frank Ackerman shows us a valuable common-sense approach to capture the true costs of toxics in our society." "A leader in environmental economics, Ackerman shows how sleights of hand and unsupported assumptions allow the health of many to be sacrificed for the profits of a few. In incisively clear prose, he makes the case for new ways of accounting in this global household that we manage for this and future generations." "Ackerman reveals the fallacies of cost-benefit analysis that are just as diabolical as the fallacies of risk analysis, two constructs designed to protect the bottom line by devaluing the importance of human health. Vast tonnages of toxic chemicals will continue to be dispersed throughout the biosphere, and the pandemic of endocrine driven disorders will continue to increase as long as the U.S. continues to use these criteria to determine the safety of chemicals. Ackerman builds a convincing case for precaution and prevention." "Ackerman convincingly argues that mistakes measured in dollars can often be undone, but avoidable deaths can't. I would argue that ignoring this well-researched book would be a serious mistake that can't easily be undone." Chapter 2. Was Environmental Protection Ever a Good Idea? Chapter 12. How Should the United States Respond to REACH?